The Latin name of this plant Cimicifuga has changed to Actaea, but we use the old name! Beautiful from the time it emerges, thru flowering, this cultivar (several other forms are available, too), offers elegant lacy, "black" foliage, along with fragrant creamy white flowers in late summer/early autumn. We like this plant, since it takes up little room in a mixed border, while adding height and fragrance. This grass comes in several different forms, including all green, several striped variations and as this cultivar suggests, gold/chartreuse. 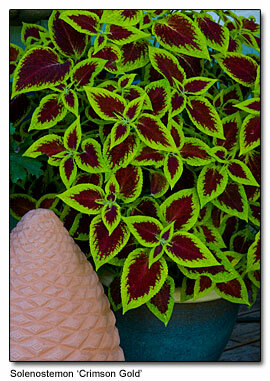 Best with a bit of afternoon shade, this plant creates a beautiful "wave" or undulation of color in the garden. As a general rule we plant gold foliaged plants in groups of three, five, or however many the pocket book can afford-unless you want to create a focal point. We won't name specific cultivars, as there as so many available. Just remember that some perform well in all day sun, whereas some will need a bit of afternoon protection. Excellent for adding some summer zing, without the need for a lot of upkeep. As we get older, both of us have less interest in summer annuals that require constant deadheading, and this plant fits the bill. Again, too many cultivars to name our favorite one… We design gardens for a living, and I can't think of one garden where we've not planted at least one Japanese maple, as this tree works so well in our urban environment. With the red/purple leafed varieties, remember that some keep their color better than others during the summer. We like to site them where late afternoon sunlight comes thru the foliage, creating a "stained glass" effect. Some cultivars offer brilliant new foliage, such as Acer shirasawanum 'Autumn Moon', a slow growing, but very worthwhile addition to the garden. Yes, green is a color. While we don't like dwarf English boxwood (too prone to disease and too dumpy), there are many excellent cultivars available. Whether shaped/sculpted into a "gumdrop", or "pillow" or whatever form, having repetitions in varying sizes is very satisfying. And, this plant can take shading from perennial neighbors without dropping foliage, creating the dreaded "gaposis", which many evergreens suffer from when crowded with rambunctious growers. If you saw this tree mid-summer, you would walk by it without a second glance, as it is just another boring pine tree. However, come winter this tree absolutely glows a brilliant gold/chartreuse/yellow (depends on how the rods and cones in your eyes perceive color). Anyway, this tree is sited where we can view it from our kitchen window, and it provides a daily anti-depressant dose each winter. Being a lodge pole pine, this tree will get tall with age, so site with care. 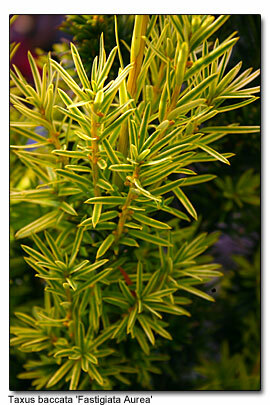 Yes, we are suckers for yellow/chartreuse foliage, and here is another excellent plant for the urban garden. The new growth is bright yellow/chartreuse, aging to a softer yellow as the season progresses. We like this plant as it adds height without taking up too much space. Like the boxwood, this plant can take shading/crowding from neighboring plants without dropping its foliage. If possible, plant three or five of these, of varying heights, in order to create visual interest in the garden. 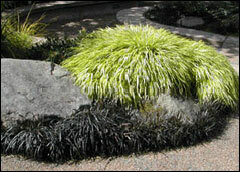 Unlike the Cimicifuga, this plant lives up to being called 'Black Mondo Grass'. Pure, flat black foliage creates a very nice foil for other plants. The emergent silvery new growth of Rhododendron yakushimanum is striking when paired with this selection. This is a plant we use in drifts, if the pocketbook allows. We found that this mondo grass takes all day sun, if irrigated; otherwise a bit of afternoon shade is prudent. The color in question here is derived from the bark. 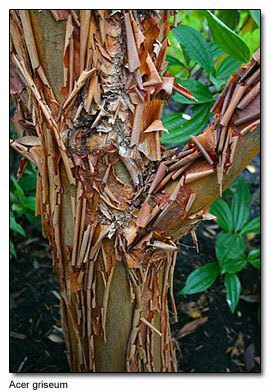 This magnificent tree has such beautiful coppery, cinnamon bark. While we enjoy this tree in leaf (and the autumnal color is brilliant clear red if sited in full sun), the real reward is seeing how the bark is lit up on winter's day. The exfoliating skin catches the light just so, and we never tire of using this tree in client's gardens, or admiring it in the landscape. Disease resistant, drought tolerant when established, this is another "must have". Frankly there are too many hostas, (we know that hosta fanatics will disagree, but please don't email us! ), but this is real performer. The bold, intense chalky blue foliage looks good from the time it emerges until autumn. 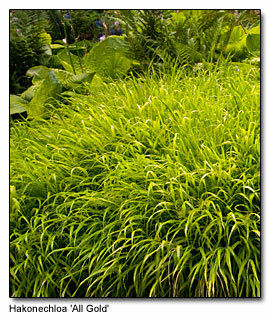 We enjoy contrasting this bold leaf with ferns or other dissected leaves, or grassy foliage, such as Hakonechloa 'All Gold'. The one caveat is, don't use a plant like this under a flowering cherry, or any other messy tree as the foliage will trap debris. Charles Price and Glenn Withey are curators of the Olmsted-designed Dunn Gardens, a historic treasure in Seattle, since 1997. Both known for their "bold and bodacious color. Top photograph by Lynne Thompson, courtesy of GreatPlantPicks.